On the campus of the University of Minnesota stands one of my favorite architectural wonders of the Twin Cities. The Weisman Art Museum, which is a Frank Gehry structure completed in 1993, rests on the edge of the Mississippi River between the East and West Banks of campus. The museum is currently closed to the public for expansion, but will reopen on Oct. 1, 2011. The last time I was at the Weisman it was midday and overcast – not the optimal time for photography. But, as travelers know, you aren’t always at the Taj Mahal at the exact moment perfect golden light streams across the memorial. Even with bad light, I still think the Weisman holds up under many conditions. However, the best time to photograph the building is at sunset when she glows and casts off a fiery reflection. The University of Minnesota is a construction war zone right now, with Metro Transit Light Rail tracks being placed through the heart of campus. The construction project won’t be finished until 2014. 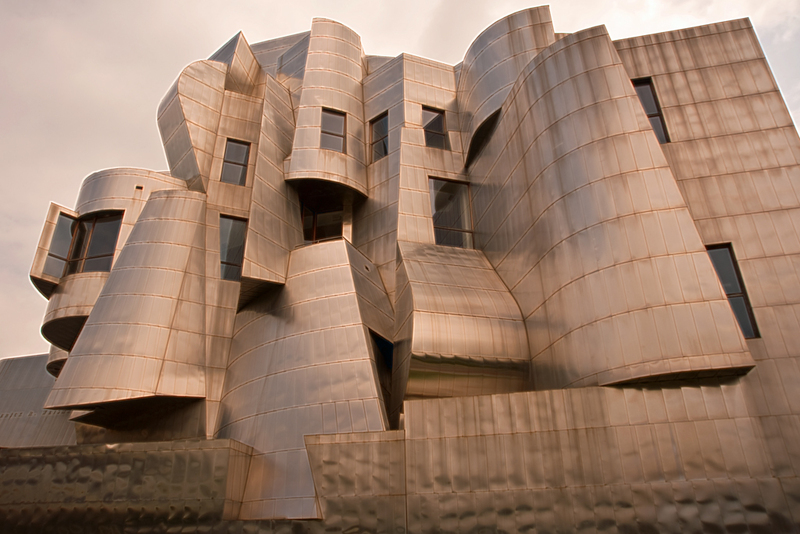 If you want to photograph the Weisman, park on East River Parkway and hike in. You can also dig out your long telephoto lens and shoot the building from across the river. This entry was posted in Photography and tagged University of Minnesota, Weisman Art Museum. Bookmark the permalink.